Start by removing the wheel with the flat. If the flat is on the rear wheel, shift the chain into one of the two smallest cogs, then loosen the axle or skewer. As a recap of what you just saw, start by removing the wheel with the flat. If the flat is on the rear wheel, shift the chain into one of the two smallest cogs, then loosen the axle or skewer. If your bike has a through axle, remove it from the bike. Quick release skewers can be loosened just enough to clear the drop outs. Now open rim brake calipers and lift the rear wheel off the ground. Pull the derailleur back to create slack in the chain, and the wheel will fall out of the frame. Removing the front wheel is even easier. Simply remove the through axle or loosen the quick release enough to clear the dropouts, open rim brake calipers, and pick up the front of the bike while giving a gentle push down on the wheel. Now that the wheel is removed, open the valve to let out any air left in the tube or tire if tubeless. Inspect the tire for tears in the sidewall or tread. Now you need to separate the tire bead away from the rim. Support the wheel on your thighs or ground. If there is a tear in the sidewall, push that side of the tire into the center of the rim until it’s separated all the way around. 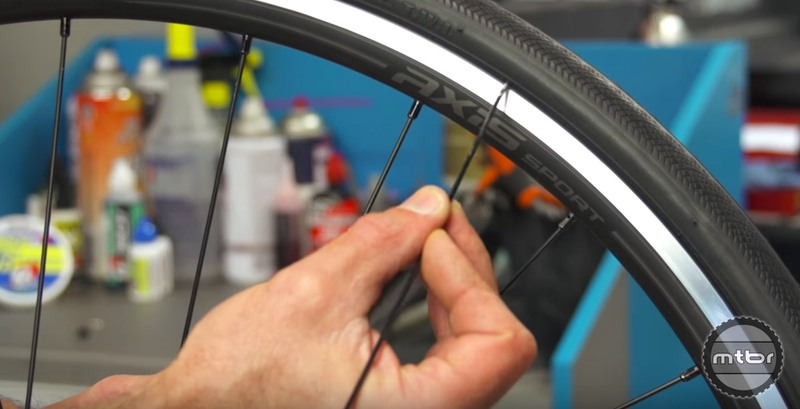 If you are simply swapping tubes (mountain or road) or putting a tube in a tubeless tire, only one side needs to be separated. 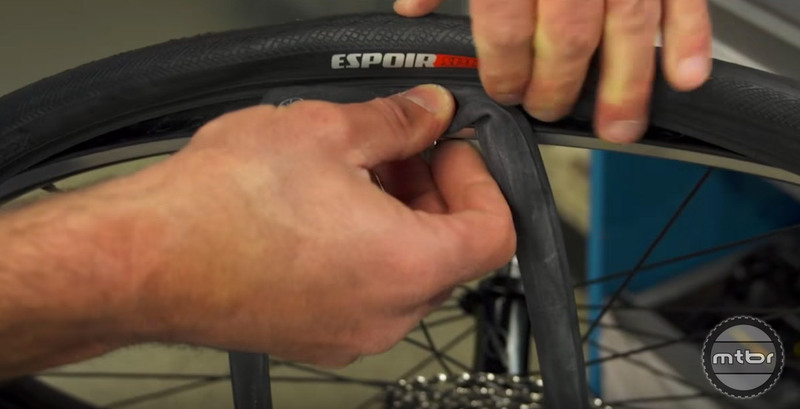 Before insertion, pump a little air into your spare tube to give it some shape. Slide a tire lever under the bead and leverage it against the rim while sliding it all the way around to lift the tire out of the rim. Be careful, some tires have a very tight fit, and if the lever slips, you’ll likely smash your knuckles on the spokes. If you are using a tube, pull it out of the tire. Then, carefully run your fingers over inside of the tire, looking for anything sharp that may have caused the puncture. If you find something, remove it. Next partially inflate the new tube to give it shape, making installation much easier. If you’re running tubeless, remove the tubeless valve stem from the rim, then insert the new tube’s valve through the hole. If there is a tear in the sidewall deep enough for the tube to show through, you’ll need to boot your tire. 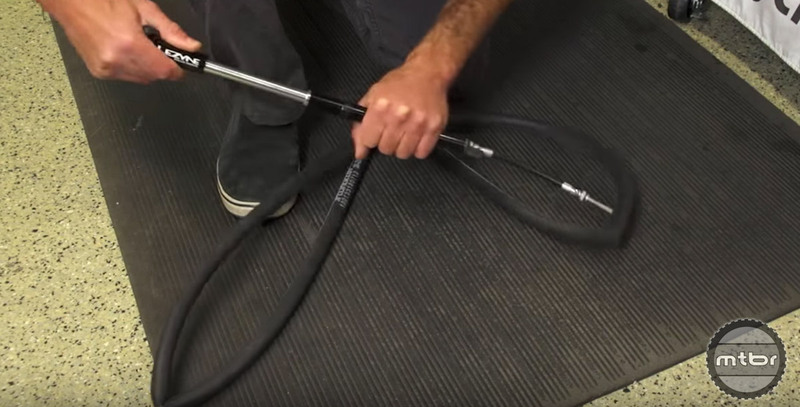 You can see how to install a tire boot by clicking here. Dollar bills or old energy gel wrappers work great. Next push the tube under the tire all the way around, making sure there are no twists in the tube. Then, starting opposite the valve, use your thumbs to push the tire over the rim’s sidewall, working your way up each side of the rim simultaneously back to the valve. Deflating the tube will make this easier. When you’ve worked to the valve, press the tire against your waist, or the ground, to hold the bead in the trough of the rim. This will give you the slack you need to push the bead up and over the edge of the rim. If you’re running tubeless, remove the tubeless valve stem from the rim, then insert the new tube’s valve through the hole. Some cyclists prefer to start at the valve, using the valve to hold the bead in place. This works on loose-fitting tires, but for tighter fits, starting at the valve will prevent the bead from sitting all the way down in the rim trough, making your job a lot harder. Either way, check to make sure the tube isn’t stuck between rim and tire bead anywhere, then inflate a bit and check again. If the tube is fully under the tire, inflate until the tire is seated all the way around the rim. Most tires have a molded line above the bead, which should be even distance from the rim all the way around the tire. Now install the valve cap and collar if that’s your scene, and put the wheel back in the bike. For rear wheel installation, pull the derailleur back to create slack in the chain and put the cassette in between the upper and lower runs of chain. Gently release the derailleur or unlock the cage if so equipped, and pull up on the wheel, guiding it into the frame. Line up the disc brake rotor in the caliper and the axle in the dropouts. Reinstall the through axle or tighten the quick release skewer. Close rim brake calipers and give the wheel a spin to make sure the wheel is centered correctly. Since flats are unavoidable, always be sure to carry an extra tube or two, tire levers, a patch kit, and a hand pump or CO2 system.